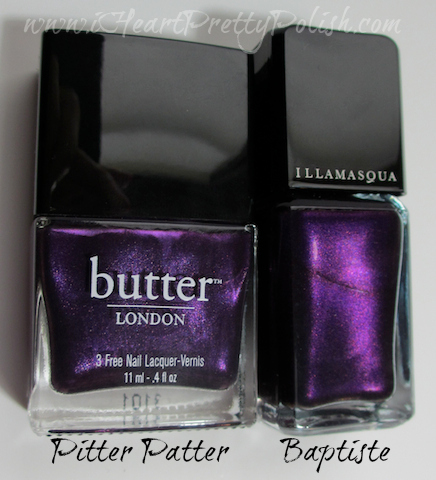 My excitement got the better of me when Butter London announced their new limited edition lacquer created in honor of the Royal Baby. It's called "Pitter Patter." I felt the need to order it ASAP...without seeing swatches first - not a common practice for me. 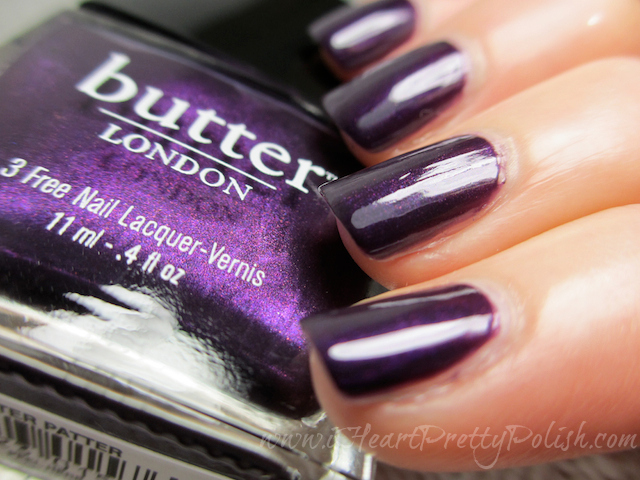 As you can see, Pitter Patter is a deep dark purple with slight shimmer. After I swatched them on the nail wheel, however, I realized that it isn't as fiery as Baptiste. Baptiste seems to have a glow from within. Pitter Patter is more smokey and muted. The swatches below show how they look on the nail. Pitter Patter pretty much looks black in real life - so if you like that sort of shade, you may want to pick it up. I would rather have more of the purple glow in Baptiste. Below is a swatch with a flash. I wanted to include this because it shows the dimension in Baptiste and shows how Pitter Patter is more muted. It just doesn't have the beautiful shimmer that Baptiste has. Note to Self : Never buy a polish without researching. What do you think? Do you like the almost black shades? OPI Lincoln Park After Dark comes to mind. Lots of people love that polish and I have never had the urge to pick it up. It's just not my cup of tea. I love almost black shades! Lincoln Park After Dark is my favorite because it's got a jelly-like consistency. Pitter Patter is such a pretty purple which you wear very well!! For you saying it was hard to apply around the cuticle area, you can't even tell! Beautiful application as always. Yes, they are nice to have. I love vampy shades like this! Very purty!! Both of them are gorgeous colors, but I personally don't think I would get both (since they are similar). :) How daring of you to make a purchase, sight unseen! If I'm remembering correctly, for what a Butter London costs, I don't thing I could do it! Pitter Patter is definitely the more muted shade, and I prefer it for that. 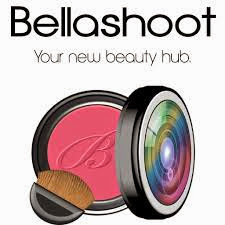 I've tried one Illamasqua and it didn't wear so well on me, so that's another point in Pitter Patter's favor... Plus, the name is just adorable ;) It's still remarkably lovely on you, even if you're not taken with it. Was it Collide that didn't wear well? I still want that one. That's the one! But the funny thing is that my longer nails seem to increase wear time, so I'll definitely be trying it again this summer. This polish looks lovely on you. I'm not a huge fan of super dark almost black looking polishes on myself. I'm not the biggest fan of that either. Thanks for your comment! Love dark colours, purple is my fav! Pitter Patter is a beautiful color on you, but I agree with you that it's probably too dark. To me, Batiste is much prettier for its shimmers and depth. And while I love purple, I'm actually not a fan of eggplant purple on me... I think the color reminds me too much of the vegetable, which I absolutely hate lol. LOL, I've never really seen an eggplant in real life!? You mean you DON'T do any clean up with an eyeliner brush? You're an amazing polisher then! I think the color is beautiful, but you have to be in the right mood to wear an almost black polish. Shame it wasn't just a bit more purple! No, but sometimes I think I should! I agree about the purple...maybe I should try it on my toes! ?